I am flat-out loving this. This has the potential to be a truly great chapter in the Dredd canon, and knows it without being arrogant. His internal monologue – thinking on the past, troubled by doubt – cements this, and it’s a genuinely thrilling tale. That aspect, coupled with a shift in focus to the antagonist’s perspective – something that 2000AD has always revelled in – drives the narrative, keeping it accessible and fresh, and the mystery has a dark alien horror threatening that makes my little Lovecraftian heart sing. It’s nice to juxtapose Dredd now with a contemporary antagonist, against a story of one of his greatest foes – and the reference to Judge Fish gives a clear sense of continuity to the long-term reader without alienating the new. This is still an enjoyable spy romp alongside an 80s Dredd vibe – it’s fun, if not quite as gripping as the previous Orlok outing. As a change of pace it works well, but it doesn’t quite shine as much as the other tales in the prog. Here, the pacing couldn’t be more different. Despite being a bridge in the tale, it feels like both a neat end to the first two parts and a clear sense of what’s to come. The art brilliantly drives this forward and Pat Mills once again shows his effortless mastery of writing episodic form. Having happily made me realise that Grey Area is rather better than I thought last prog, Abnett continues to show us his crew’s frustration by putting them in a box for observation. This works to an extent, as it brings out the characters’ personalities for the uninitiated, but it feels a little forced, and I find myself feeling much like our aliens – not really caring. It’s a shame as I really want to see more of this, and whilst I understand the narrative device, I’m not sure I have the patience. Now it’s trite to say that anything these two do is going to be unmissable. That said, I don’t care It’s unmissable. It’s so clever, so funny, and so well drawn – never mind that you could come to this having never read Strontium Dog, never read Dredd, never read 2000AD, and still get fired in. Talk about ending on a high. 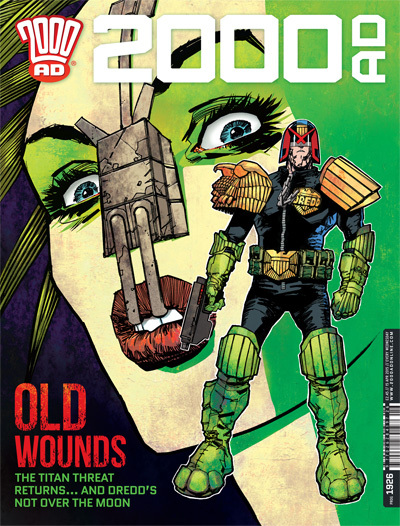 Sharply observed and wry, with great action and a genuine mystery, this is 2000AD at its best. Still full of thrill-power, 2000AD is now at risk of suffering from its own reformatting: I want a new thrill to keep me interested. We’ll see what 1927 brings; either way, it’s still the best way to spend your earth money on a Wednesday.